LOWER MANHATTAN (WABC) -- Repairs are underway after glass fell 18 floors Wednesday afternoon from a popular hotel in Lower Manhattan. 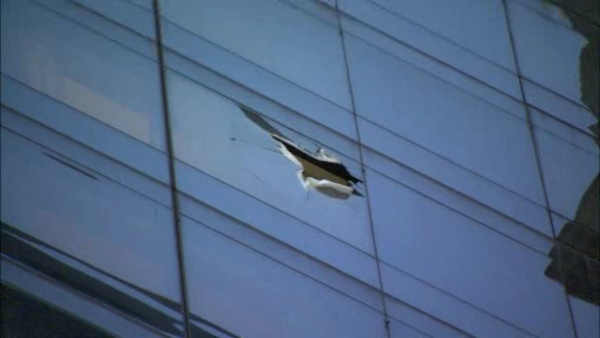 At 3:40 p.m., the FDNY responded to 55 Church Street, site of the Millenium Hilton hotel, for a report of falling glass. A hotel spokeswoman says a piece of metal, about 1 foot by 1 foot, flew into the window of a guest room, causing it to break. It's not clear where the metal came from. No one was in the room at the time, and no one was hurt. A glass contractor headed to the hotel for repairs. Dey Street was closed off to pedestrians and cars. The hotel says it is fully cooperating with local authorities in the investigation.